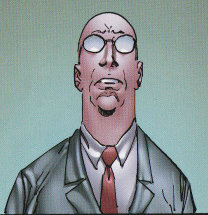 Smith is Dragon’s lawyer whom he hired to help him deal with the fallout of accidently killing Solar-Man. Dragon also put him in charge of making the Darling’s the legal guardians of Malcolm and Angel in case he were to die. Later, when Dragon returns to Earth, he once again retains Smith’s services in dealing with his incarceration due to his actions as Kurr. Smith begins to get his case together by preparing Malcolm and Angel to get their stories straight for the trial in a fashion that makes what happens to Dragon understandable. When Dragon asks him what’s the worst thing that could happen to him if he is convicted, Smith tells him the “the death penalty”. Smith later visits Dragon in jail and tells him to be careful in prison as Dragon murdering Urass is making it harder for him to appeal Dragon’s case.